The FDA has approved Myriad Genetics’ BRACAnalysis CDx test as a companion diagnostic for the latest indication of Lynparza (olaparib), in addition to expanding the approved uses for the poly ADP-ribose polymerase (PARP) inhibitor co-marketed by AstraZeneca and Merck & Co.
Myriad’s BRACAnalysis CDx was authorized for identifying patients with HER2-negative metastatic breast cancer who have a germline BRCA mutation and are candidates for treatment with Lynparza—the first and only FDA-approved test for use in the indication. 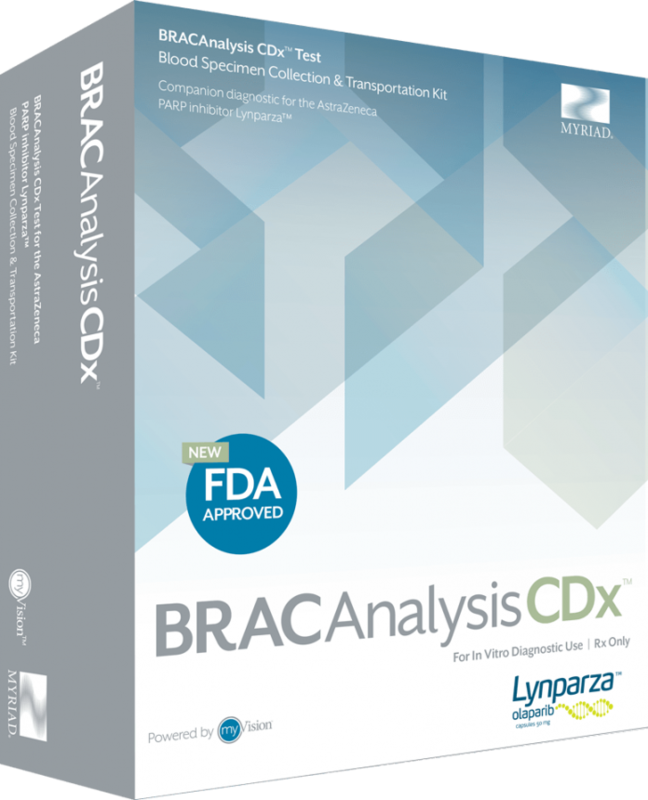 The FDA’s approval adds a second indication for BRACAnalysis CDx for use in conjunction with Lynparza. In December 2014, Myriad won FDA approval for BRACAnalysis CDx as a companion diagnostic to help identify patients with advanced ovarian cancer who are eligible for fourth-line treatment with Lynparza, which was approved at the same time the treatment won its first authorization by the agency. Lynparza was initially approved for maintenance treatment of adult patients with recurrent epithelial ovarian, fallopian tube or primary peritoneal cancer, who are in a complete or partial response to platinum-based chemotherapy. “As the pioneers in identifying likely responders to PARP inhibitors, we are excited to broaden the use of BRACAnalysis CDx as the companion diagnostic for this important new indication,” Myriad Genetics President and CEO Mark C. Capone said in a statement. The FDA paired its approval of BRACAnalysis CDx with authorization of an additional treatment indication for Lynparza—patients with deleterious or suspected deleterious germline BRCA-mutated (gBRCAm), human epidermal growth factor receptor 2 (HER2)-negative metastatic breast cancer who have been previously treated with chemotherapy in the neoadjuvant, adjuvant or metastatic setting. The FDA based its approval of the new Lynparza indication on positive results from the Phase III OlympiAD trial (NCT02000622), which compared Lynparza to physician’s choice of chemotherapy (capecitabine, eribulin, or vinorelbine). Lynparza significantly prolonged progression-free survival (PFS) compared with chemotherapy, and reduced the risk of disease progression or death by 42% (7.0 vs 4.2 months). According to OlympiAD results, patients with measurable disease taking Lynparza (n=167) experienced an objective response rate of 52%, double the response rate for those in the chemotherapy arm (n=66) which was 23%. Patients experienced a confirmed complete response rate of 7.8% for Lynparza compared to 1.5% for the chemotherapy arm. Trial results were published in the June 2017 issue of the New England Journal of Medicine. OlympiAD also showed BRACAnalysis CDx test to have accurately identified patients who had a germline BRCA mutation and thus could benefit from Lynparza.